From the Hancock County Courthouse, take Hwy 22 southwest for 7.2 miles to Devereux. Turn right (at backwards fork) in Devereux onto Main Street. Go 0.2 mile to the dead end and turn left onto Jones Chapel / Devereux Rd. Go 1.3 miles. Turn right on Warren Chapel Road and go approximately 2.7 miles. 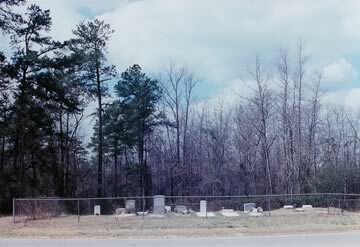 The cemetery is on the left side of the road. Only one date appears on stone. Infant slab and so birth and death date assumed. "I am that I am." "At rest"
Name per funeral home marker (piece of paper inside metal marker). Possible grave with rectangular cut stone.